When I bought this #Alchemy Jaime King x Colourpop set a couple of months ago I thought five of the colors were eye shadows and one was a blush. 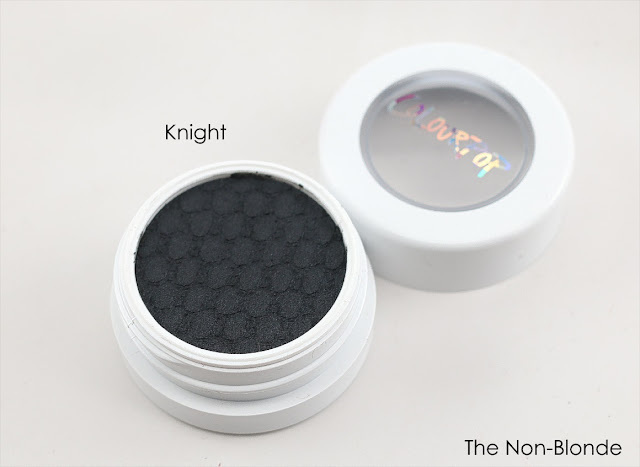 I was wrong, since two of the colors I considered to be eye shadows are actually highlighters and pack some serious glow voltage. I'd still rather use them as eye shadows. but that's just me. Other than that, the versatility, colors, and textures make #Alchemy a great all-season set. I admit that I wanted it more for said versatility than for the Jaime King connection (she's very lovely, but I don't know much about her beyond the basic career milestones, her friendship with Taylor Swift, and the fun trivia fact that she was named after the Bionic Woman character). 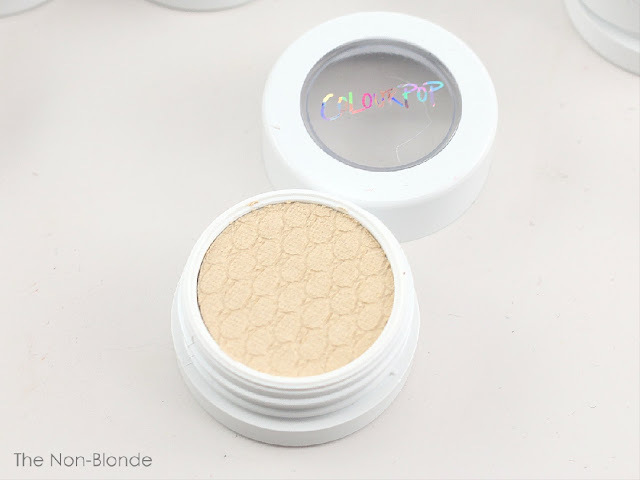 Those of you who don't like the Colourpop Super Shock formula are not going to change your minds. It's still this bouncy cream-to-not-quite-powder formula that applies best with fingers or with a silicone applicator, blends with a fluffy 217-type brush and has a high-impact finish. I love it, so it's all good. 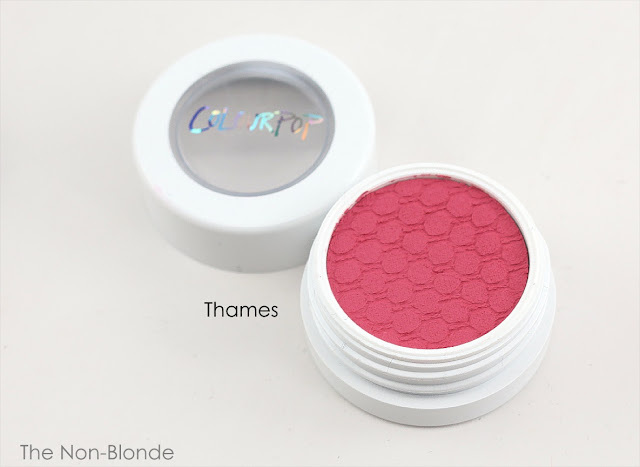 The part that was completely new to me was the matte blush. 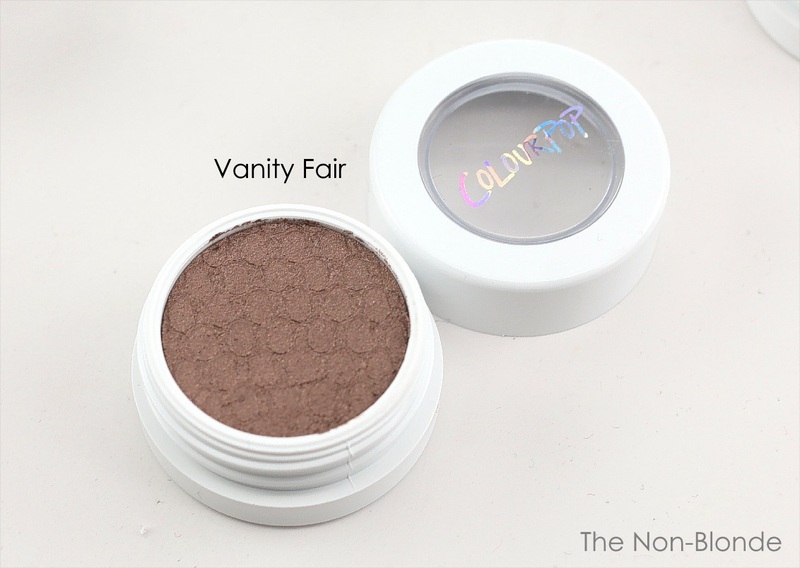 It's a beautiful formula, similar to the matte eye shadow one in both application and intensity. The blush color in this set, Thames, is serious stuff. 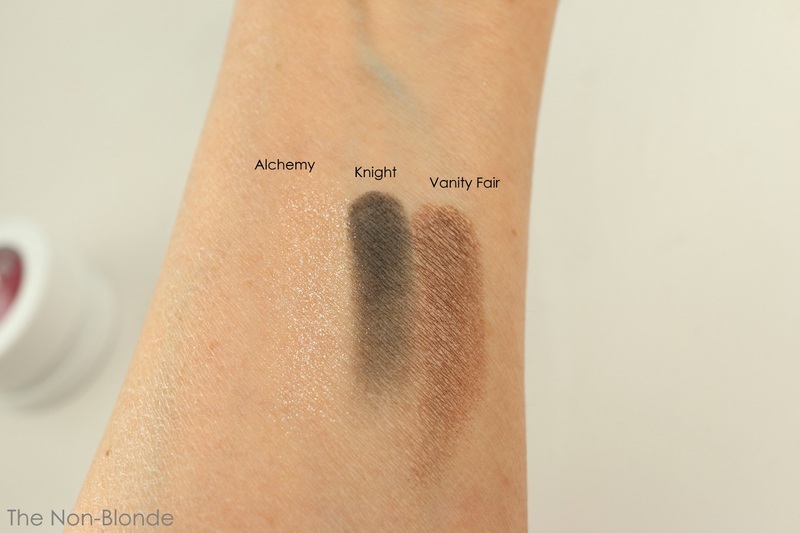 I've been following Colourpos's advice and blending it with a good duo-fiber brush (Hakuhodo G5552 and MAC 188), and will add my own insight: when you think you're done blending, blend some more. 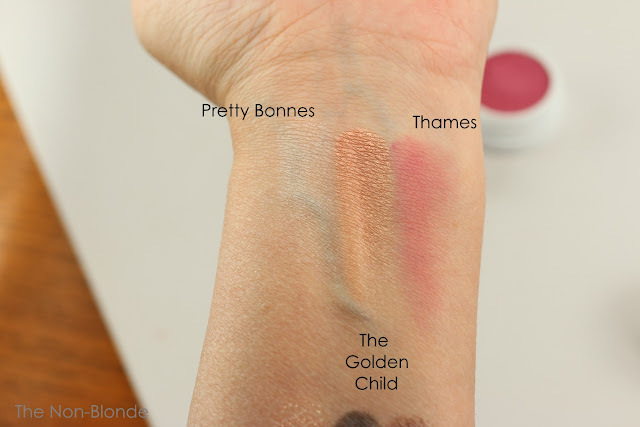 On my skin, Thames takes a turn towards raspberry, which is pretty bold; hence the extra blending. 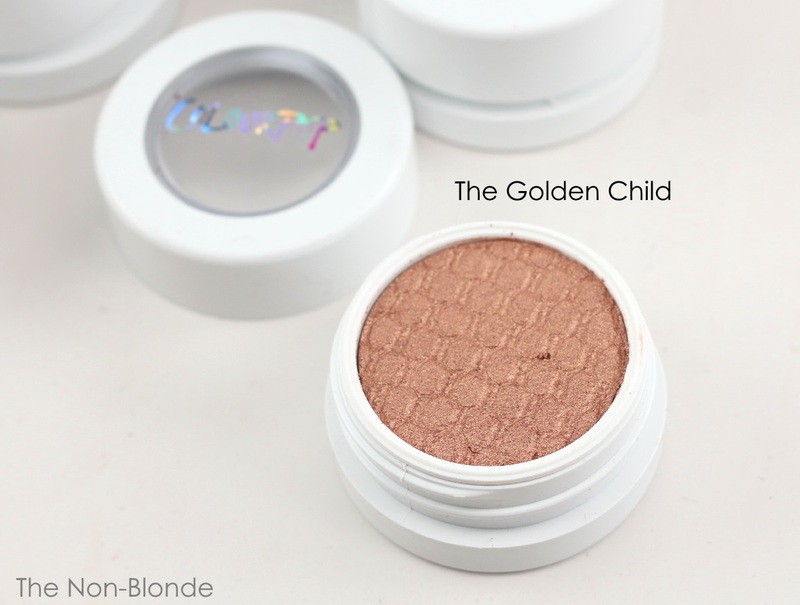 The other cheek colors are Pretty Bonnes (pearlized finish), which is an ivory/pale gold highlighter, and The Golden Child (pearlized finish as well), a stunning copper. They look quite metallic on skin, which is another reason I'm not crazy about using them over the cheekbone. I'm guessing they were made for Instagram makeup more than for my middle-aged self who goes antiquing almost every weekend. I do love them as eye shadows, and find that they stand beautifully on their own with nothing but an eyeliner and a mascara. Beautiful colors, beautiful finish. Here Knight is topped with Alchemy. I'm unconvinced. The eye shadows are Alchemy, which has little pigment (peach, in theory) and is all about its sheer glitter finish. I'm not a fan, even when tapping it over another color, probably because it's not even enough for my liking. I'm not opposed to glitter, I just want it to have an actual color and make an impact if I'm going for that. 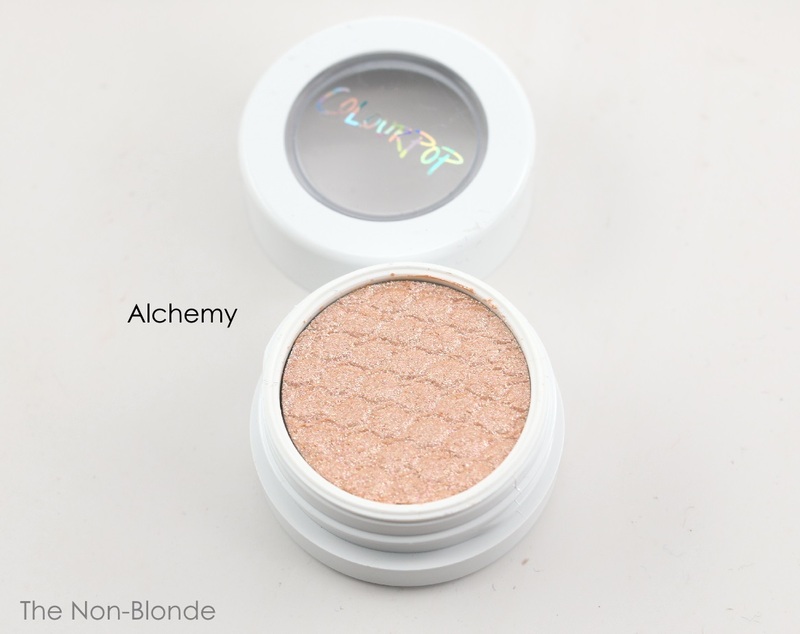 Alchemy is too wishy-washy to be an effective glitter, and too glittery to look good as an eye shadow for me. Knight is a smooth velvety black in a satin finish. 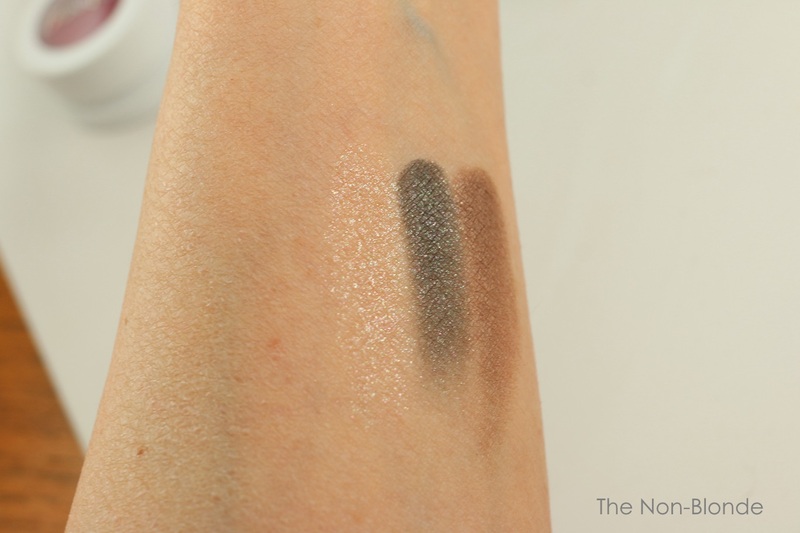 It's a spectacular opaque black base that requires moderation in application and a cleanser for removal. Vanity Fair is my favorite of the bunch. It's cool brown that's almost taupe with a pearlized finish. You can't go wrong with this. 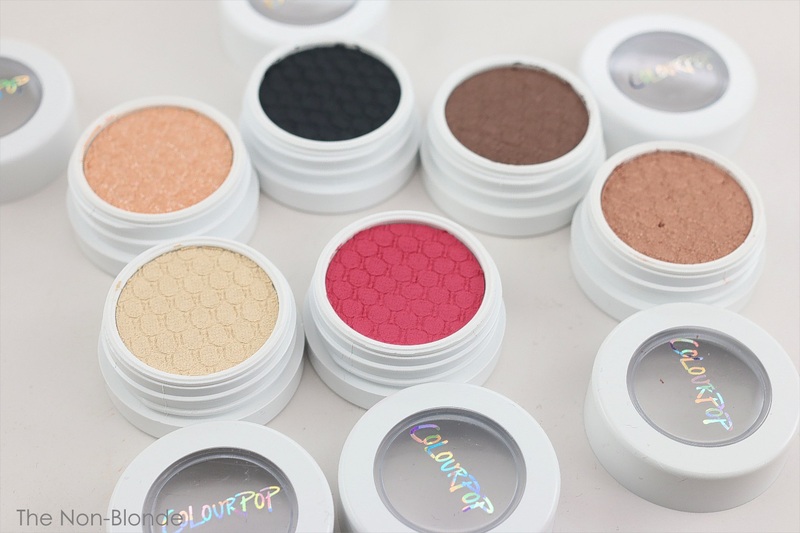 Colorpop eye shadows are notorious for drying out if you don't make sure they're closed very tightly. I wish they'd come with a plastic protective cap like Lancome and L'Oreal cream shadows. I'd be willing to pay a little extra for that. Maybe I should get crafty and make an air-tight thingy for them. 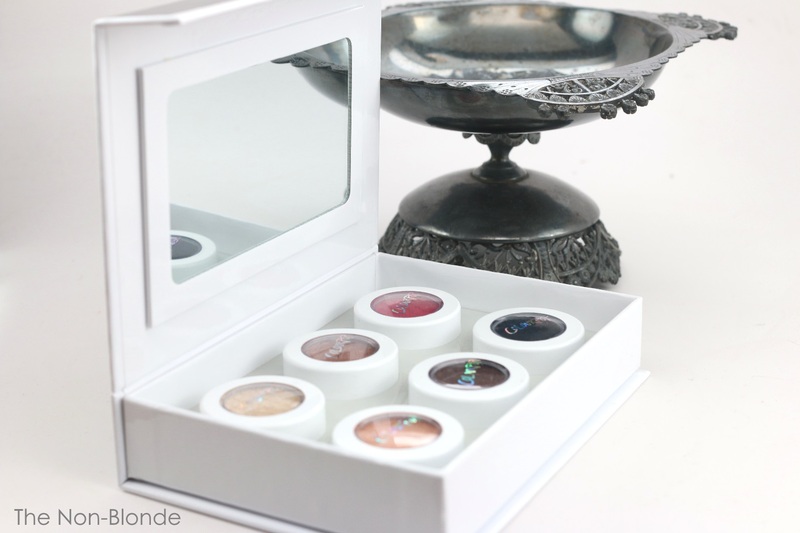 Bottom Line: Pure makeup fun. 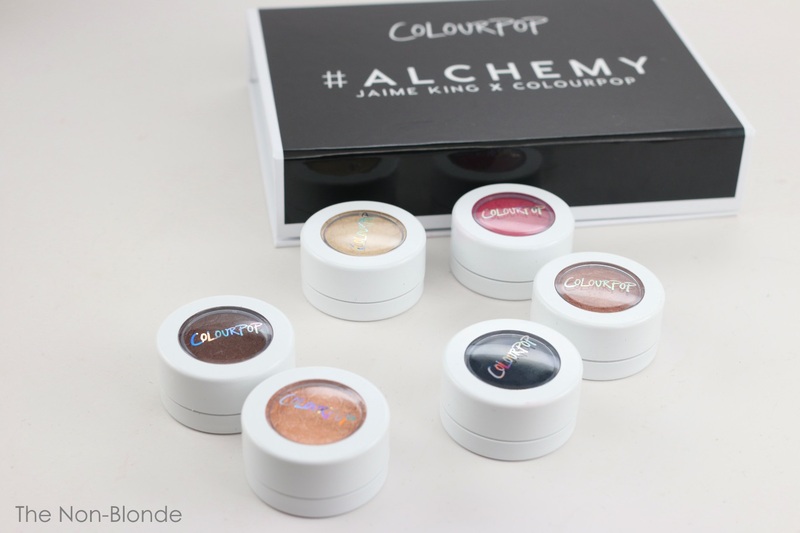 Actress Jaime King teamed with Colourpop on the #Alchemy Collection, which includes this set ($30, made in USA) of eye shadows in various finishes, a matte blush, and two highlighters. All six items can also be purchased individually purchased individually ($5-$8 each). The full #Alchemy collection also includes other items that I've chosen to skip: a couple of matte lipsticks and lip liners, a contour stick and a highlighter stick. They're available from colourpop.com (look under Collaborations).